It has been a long time since I read fiction and I read quite slowly and take only a little time each day for reading. So, my husband suggested this series to me. And now here is my take on all three books. I will go through each book, present its storyline and what I felt about each book and conclude with my opinion on the entire series. If you have not read the books or watched the movies, beware of spoilers! Let’s start with the first book The Hunger Games. Katniss Everdeen, the protagonist, is from the poorer section of District 12. Her sister Primrose, who is 12 years old, is chosen as the girl tribute to represent their District in the hunger games, where the tributes fight each other to death. Out of sheer love and fear for Prim’s life, Katniss volunteers as the girl tribute in place of her Prim. Hunger Games are organised and conducted by a group of people referred to as the ‘Gamemakers’. These gamemakers are at liberty to make the Games deadly for the tributes so that they are entertaining for the audience. The story is about how Katniss and Peeta, the boy tribute of District 12, play the Hunger Games and emerge as victors. While both are elated that they the worst part is over, Katniss realises that she has made it in to the Capitol’s watchlist. This is because the Capitol feels that she had defied them by her move at the end of the games to ensure her survival as well as Peeta’s. Katniss is portrayed as a tough girl, who loves her sister Prim more than anyone or anything. Her determination in ensuring Prim’s wellbeing after their father’s death and mother’s depression is explained very well. She would rather tell the truth because she cannot lie convincingly. As a sharp contrast to Katniss, Peeta is the nice guy who does not care much about winning the game. He has the power of speech and spontaneity with which he sweeps people off their feet. 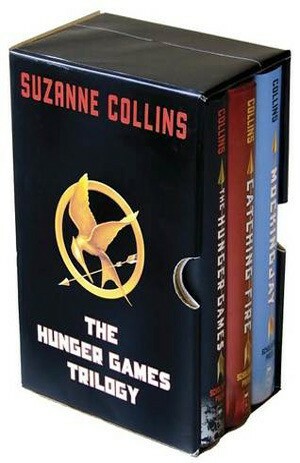 This book, as the other two, are narrated in the first person by Katniss in the present tense. This style allows Katniss to be in the forefront and look at the events from her perspective. The first chapter is one of the best portions of the book where the introduce “reaping” and give details little by little keeping your interest piqued. The concept of Hunger Games and reaping and the why of it are explained towards the end of the chapter. There is a clear background on the entire political / social set-up and how people in District 12 fare in comparison to the Capitol. Also, the story travels along the path of Katniss’s fight to win the Games and to get back to Prim. There are numerous references to Katniss thinking of Prim throughout the book — like, Prim will be getting ready to school now or Prim would have milked the goat by now or Prim will be watching me in the TV screens, I need to be put a brave face, etc. Unexpected alliances between the players, how Katniss manipulates the audience and the sponsors to keep fighting in the games, how she uses her hunting skills for her survival, etc. are described in great detail that it is almost like watching a movie or reading an illustrated book. There is a lot of action and suspense packed in to this book, which keeps you glued to the book. The one thing that keeps bothering me is that when Katniss gets back to District 12 after winning the games, there is nothing much about Katniss’s happy reunion with Prim? Or am I expecting too much from the book? Apart from this one thought, I just loved the book. Book 2 picks up from where book 1 left off. President Snow is eager to crush any rebellion or even uprising of the smallest scale before it could start. He personally threatens Katniss of dire consequences if she does not do as she is told. Katniss figures that her suicide stunt at the end of the games is the reason. Fearing for Prim’s life, Katniss agrees to be seen as Peeta’s girlfiend in public. Since Gamemakers have a freehand in the execution of the Games, Peeta and Katniss are chosen for the next year’s Hunger Games as well. They prepare themselves for another deadly experience. The arena this time is half beach, half jungle, most suitable for district four which specialises in fishing. The tributes from districts 3, 4 and 7 come team up with Peeta and Katniss. The forcefield around the arena explodes in the climax and Katniss wakes up to Gale telling her that Prim and her mother are safe but District 12 is no more. That is how book 2 ends. Catching Fire was good, but definitely nowhere nearly as exciting as the Hunger Games. Even though this book is also narrated by Katniss, the focus had shifted from Prim in book 1 to Peeta in book 2. The Capitol trying to punish Katniss or get rid of her one way or the other is nothing unexpected. In the arena where the tributes are expected to fight and kill, we find that most of the tributes not only fight alongside Peeta and Katniss, but also keep Peeta alive. This seems too apparent that it was all planned beforehand without the knowledge of Peeta or Katniss. There is not much of a suspense or any unexpected turn of events. The book does not explain where Peeta was, his condition or what exactly happened to District 12, which are answered in the next book. Mockingjay the third book is where district 13, led by President Coin, accepts refugees from those districts which were attacked by the Capitol. It turns out that 13 is in fact a nuclear superpower and was let to live by the Capitol if it was willing to play dead to the rest of the world. A hint about the underground life in District 13 was given in the second book. Haymitch (a victor from District 12 in the past and mentor to Katniss and Peeta for the Hunger Games) and a few gamemakers were part of a rebel group based in District 13 which had waited for decades for the right time to strike the Capitol. They had rescued Katniss, Finnick, Beetee and Johanna from the arena while Peeta and the other tributes were taken as prisoners by the Capitol. Book 3 is all about uniting the districts to overthrow the Capitol system, with Katniss becoming the Mockingjay symbolising the rebellion. Katniss agrees to it in exchange for immunity to Peeta and other tributes imprisoned by the Capitol. District 13 is bombed, while Katniss and a small group of soldiers go to the Capitol to kill President Snow. Instead, Snow is captured by the rebels and Katniss gets an audience with him, before his fate is decided. He tells her that it was not Capitol’s bombs that killed the rebels but their own, killing Prim along with the other rebels. Coin suggests restarting the Hunger Games with participation by the kids of the Capitol, which is to be decided by the victors. The majority votes in favour. People expect Katniss to execute Snow, but she kills Coin instead. Snow dies though no one knows how. Katniss is certified mentally disoriented, supposed to attend her sessions with a doctor, sent back to district 12, her mother is in district 4 working at a hospital, gale moves to district 2, Peeta is in 12 and so is Haymitch. After sometime, I don’t understand how long, Katniss decides to move on. She realises that it is Peeta, not Gale, who will be her life partner. The conclusion to the trilogy moves forward to about 15 years where Peeta and Katniss have 2 kids, who grow up without the fear of hunger games, which has long been abolished. Whew! I initially did not know what to think of this book, other than that it was a huge let down. I mean, for the vast majority of the book, not much happens — too much of time spent on strategy, but nothing outstanding and all the noteworthy stuff seem to happen in the blink of the eye in the last few pages of the book in total haste. Overall, the focus has shifted to the rebellion to overthrow the Capitol but the way things were carried out seemed very arbitrary. I am no military expert, but still I don’t think there were any brilliant strategies or techniques that are used to gain support from the other districts. Coming to specific issues, District 13 is described as a military base which is struggling with limited resources including people. That is why anyone 14 years of age or older become soldiers. But, Katniss, one of the soldiers, regularly misses scheduled physical training sessions and no one objects to it? Katniss bluffs to a group of ranking officers that she was sent on the mission to kill snow and without much deliberation, they believe her? Hmmm. Again, it is about family reunion — Katniss survives the hunger games for the second time and comes to meet her mother and sister in District 13. She brings Prim’s grumpy cat Buttercup and a photo from her home. She comes in to their apartment and her mother hugs the photo and Prim hugs the cat. That’s that — so much for the reunion. Ok, I am definitely expecting a lot from the book. Somehow, I was not very convinced by the way Prim’s death was revealed in the third. It comes as a very casual mention by Snow during a private conversation with Katniss after his capture. Prim, being the central focus of the first book and to a great extent in the second book, just dies in the bombings? Alright. Also, I expected her death should be coming as a big blow to Katniss. She actually throws a tantrum in the second book after she is chosen for the hunger games again. Compared to that, her reaction to knowing about Prim’s death was more like “oh, whatever” while you hear something inconsequential like “it might rain today”. When it comes to restarting the hunger games with the kids from the Capitol, it looks like a huge thing to me. The way it is mentioned — the group of victors, a good part of whom are people who had been mentally deranged in the recent past, are asked to vote yes or no at a moment’s notice. Seriously? That is sheer absurdity. The only saving grace is Peeta who is the first and the vociferous one to vote no, despite having just recovered from the effects of hijacking by the Capitol. Beetee and Annie vote no and Johanna and Enobaria vote yes, which is quite expected. But Katniss votes yes and says “for Prim”. What? How is it that she says yes and how is it for Prim’s sake? How does it make sense? Would it not be fair punishment to send Snow and the gamemakers in to hunger games to fight each other to death, instead of their children or grandchildren or the Capitol kids in general? I personally felt very sad that Prim was killed and that it was dealt with very casual manner and worse, it was used by Katniss to restart hunger games. After all this, I felt that I should have stopped with the first book, never have read books 2 and 3. Books 2 and 3 are very far from the initial story and way too diluted, compared to the first book. When you look at the series, Katniss had a difficult life at the start, but she does manage well with her hunting and gathering skills. She has Prim, her beloved sister and Gale, her partner in crime and best friend. Apart from her father’s death, she is quite happy with present life. Her thoughts on getting married or having kids are clear — no; because the thought of the kids being chosen as tributes is scary. But, after playing the hunger games, she has no choice but to join the rebels. Towards the end of the series, she has lost almost everyone in her life — Prim dies, Gale moves on, she tries to repair her relationship with her mother but her mother moves to another district. All she is left with is Peeta. She rebuilds her life from the ruins in District 12. She figures that she needs Peeta, not Gale, in her life. Peeta’s love and the abolition of Hunger Games give her hope. She marries Peeta and their two kids grow up in District 12, which is no longer a coal mine, but a hub for manufacturing medicines. A happy ending, I would suppose. Thanks for listening. We welcome your comments and opinions about the books and also your feedback. Bye! Click here to support Digital Amrit by buying The Hunger Games from Amazon.